The matchless glass design creates mesmerizing moments. Only Sealine gives you such a generous panoramic view. Barbecue under the open skies: the outdoor grill, which has been specially developed for Sealine yachts that turns each meal into an exceptional experience. Dive, swim, sunbathe … all from the bathing platform. Featuring a hydraulic lowering functionality, it is the perfect place for relaxation. Opt for a design that no one will be able to resist. Which is stylish and sophisticated. Which sets trends and stands for the highest quality of life. Three double cabins and two bathrooms offer elegant living like no other – and give each person on board a personal favourite spot. A double pilot and a co-pilot seat enable more guests to enjoy the cruise in the front row. 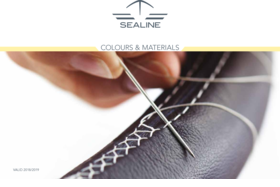 Your Sealine C390 is customised according to your preferences – we combine impressive craftsmanship with high-precision tools. The ensemble of the finest leather, our own unique fabrics and the delicately refined woods underscore your exquisite lifestyle.